This commentary originally appeared in the San Antonio Express-News. For months, media outlets across the state have introduced Texans to children who could lose life-changing therapies because of new state Medicaid cuts. Texans met Baylee, an 11-year-old girl with cerebral palsy who lives near Lubbock. She is unable to talk but has learned to communicate in other ways with her family thanks to Early Childhood Intervention (ECI) and regular therapy. News outlets also introduced Texans to twins in Corpus Christi named Alyssa and Ava. When they were born three months premature, doctors told their mom the girls would never walk. Thanks to physical therapy, the 9-year-olds can walk, though they need ongoing therapy to continue making progress. We also learned about 2-year-old Angeline, who was born with fluid on her brain. She’s learning critical new skills, like walking, thanks to ECI services provided by the Austin nonprofit group Any Baby Can. And Texans learned that local nonprofits in Tyler and elsewhere pulled out of the state’s ECI program partly because of those Medicaid cuts, leaving parents scrambling for services. Those Medicaid reimbursement cuts for children’s therapies — passed by the Legislature in 2015 but delayed as the courts took up legal challenges — have been severely criticized by parents, the media, community groups, and many of the same legislators, both Democrats and Republicans, who originally voted for them. But, if Congress goes through with plans to turn the entire Medicaid program into a block grant, we can all expect to meet many more vulnerable Texans who would suffer and fail to reach their potential due to further cuts. The cuts, either through a Medicaid block grant or a similar “per capita cap” policy, are high on the agenda as Congress and the new President get to work this month. The Medicaid plan proposed by former U.S. Rep. Tom Price, selected to serve as Health and Human Services Secretary in the next administration, would cut funding for Medicaid and the Children’s Health Insurance Program (CHIP) by a third in the next decade. The cut will be even deeper if Congress repeals the Medicaid expansion funding that many states have accepted. Under the plan, states would receive a set amount of Medicaid funding instead of the dollars necessary to serve all the eligible people in the program. Additionally, federal funding for states wouldn’t account for downturns in the economy or unexpected increases in health costs due to new treatments or epidemics like the Zika virus. The bottom line is that states would have to make significant health care cuts. Here in Texas, 96 percent of people receiving Medicaid are low-income children, pregnant women, seniors, or people with disabilities. 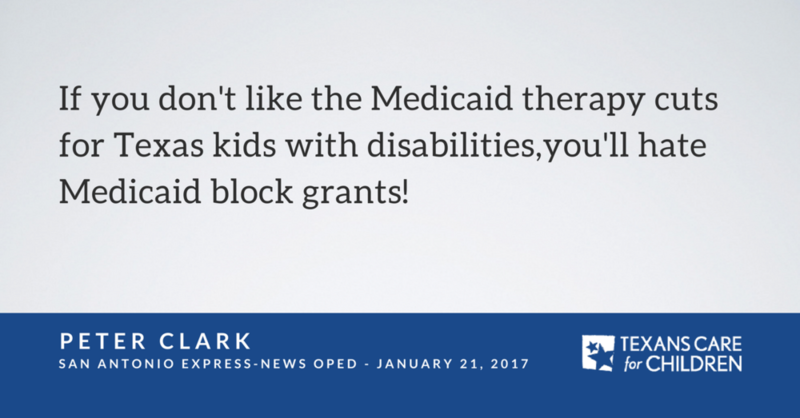 Elected officials who are advocating for block grants should tell us which of these low-income Texans they want to cut. As an organization focused on the needs of Texas children, we can tell you that cutting health care for pregnant women and for children, including those with disabilities and developmental delays, is a bad idea. Helping moms have healthy pregnancies and helping kids grow up healthy is smart policy. It ensures more Texas students succeed in school and our state continues to prosper. Like providing basic care for poor seniors and Texans with disabilities, it’s also the right thing to do. We urge Congress to shelve its Medicaid block grant proposal. If not, Texans can expect to meet a lot more of their neighbors like Baylee, Alyssa, Ava and Angeline. Peter Clark is the Communications Director for Texans Care for Children.